I’m still working on the crochet skirt. As I work on each vane, I have to bind off the different colors, which leads to balls of crochet thread left sitting on random horizontal surfaces. This is reasonably safe, as we currently have no felines in residence — except when it isn’t. 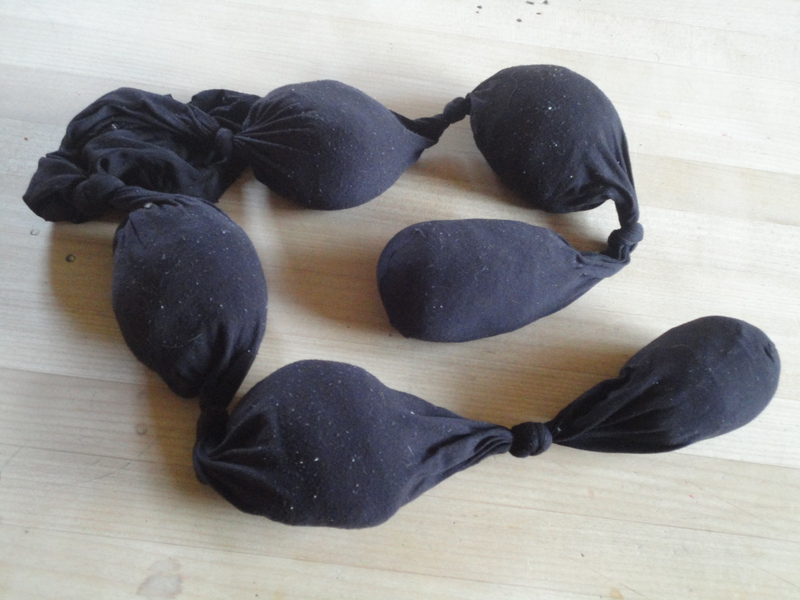 Last week a bottled drink was opened on a table with half a dozen such balls on it — and the bottle fizzed over, leaving the balls a tad sticky and in no condition to crochet with. I didn’t want to throw them out and replace them, so I knotted them into a pair of nylons (amazingly, I have some, although its been at least a year and a half since I’ve worn them) and put them in the washing machine, then through the dryer twice. After the nylons have been through the laundry. Now, the downside of this is that cotton thread is wrapped on cardboard cores, and cardboard doesn’t do too well in the washing machine. When I took the nylons out, the balls were noticeably smaller than they’d been previously. 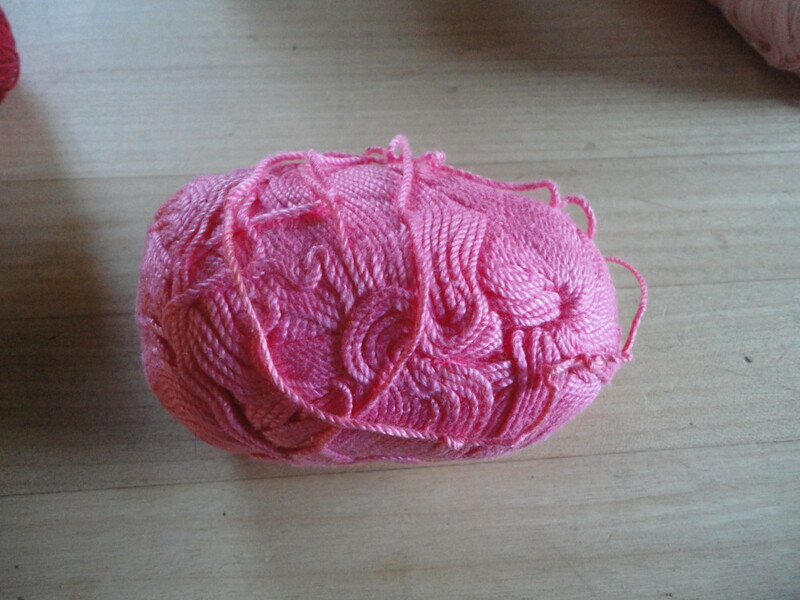 When I took the balls out of the nylons, they had some interesting patterns from the way the thread had compressed. 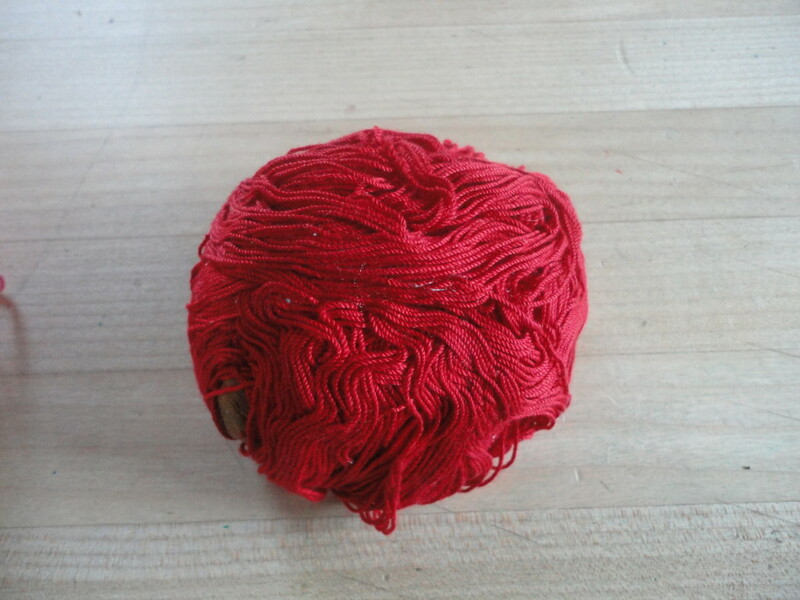 I love the way the whorls of thread look on this. My husband reminded me that we do have a stock of cardboard tubes around (I save toilet paper rolls for our daughter’s daycare to use in crafts. One of these months, I’ll even remember to take them in! 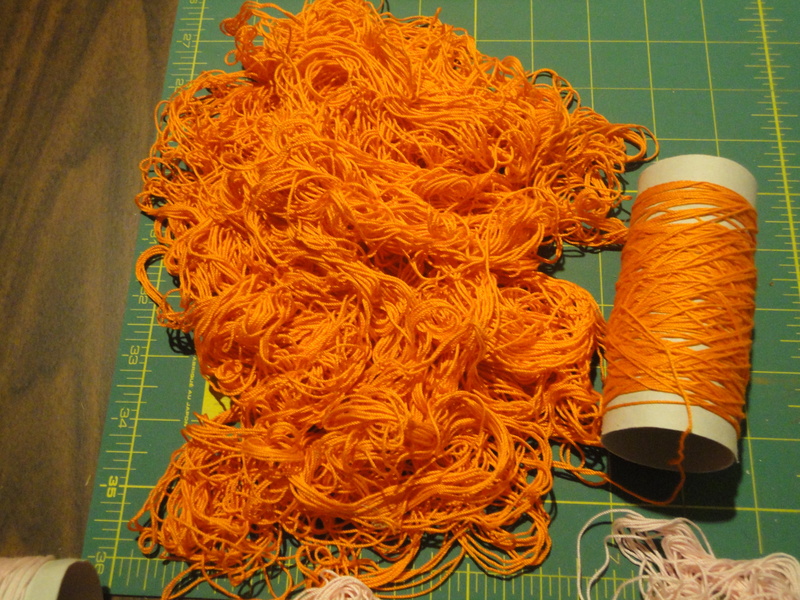 ), so I began re-rolling the thread onto the new tubes. 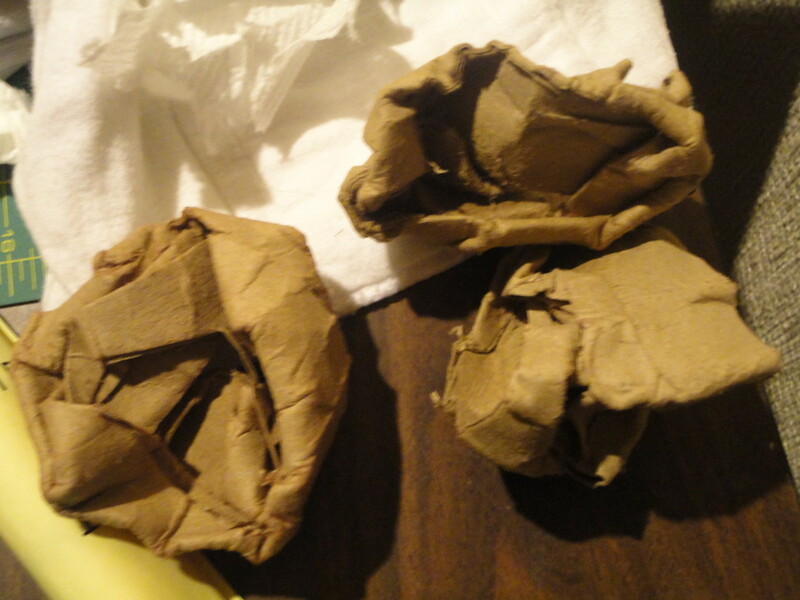 Unfortunately, the balls are so thick that even two trips through the dryer hadn’t managed to get all the thread dry, so after I wound some of the thread onto each tube, I had to just pull the rest of the thread off the remains of the original cardboard and leave it piled up to dry. Now I’m in the final stage of this process, finishing the winding onto the new tubes — with lots and lots of untangling and unknotting along the way. 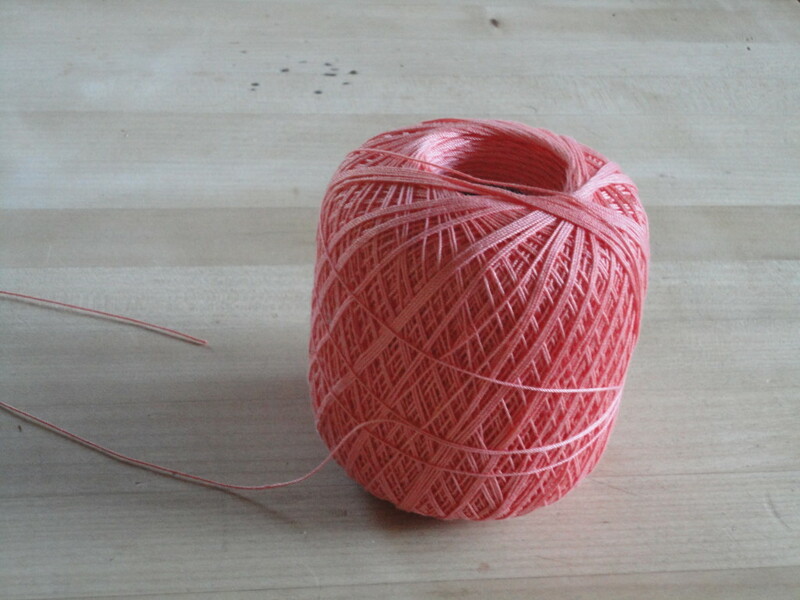 In a week or so, I should be able to get back to the crocheting. This entry was posted in handcrafts and tagged crocheting by Sara Penhallow. Bookmark the permalink.